Composer Edvard Grieg, the icon of Norwegian music, left his home in Bergen, Norway to study at the conservatory in Leipzig. There he began his formal musical education under the auspices of Ignaz Moscheles (piano) and Carl Reinecke (composition). While in school, the young composer saw the premiere of his first work, his String Quartet in D minor, performed in Karlshamn, Sweden. Despite being diagnosed with a form of tuberculosis, which left him with only one functioning lung, Grieg graduated from the conservatory in 1862. The composer had an intense desire to develop a national style of composition, but recognized the importance of becoming well versed in the work of the European masters, and consequently relocated to Copenhagen, studying with Niels Gade. He was thus able to remain in Scandanavia, while working in a thriving cultural center. In 1867 against his family's better judgment, Grieg married his cousin Nina Hagerup, a talented pianist, but whose vocal abilities enchanted the composer even more. Shortly after their wedding, the couple moved to Oslo, where Grieg supported them by teaching piano and conducting. He and his wife traveled extensively throughout Europe and it was during a period of time spent in Denmark, the composer wrote his landmark opus, the Piano Concerto in A minor. The premiere was given in 1869, with Edmund Neupert as the soloist. The piece was received with an enthusiasm that would attach itself to the composer's reputation for the remainder of his career. Norway's most famous composer, dedicated his career to the pursuit of a national sound. The respect he had for his predecessors illustrates the sincerity with which he worked towards this goal. He wrote in the Romantic tradition with, in his own words, the determination to "create a national form of music, which could give the Norwegian people an identity." As a miniaturist, Grieg was a master. In particular, some of his most characteristic work can be found in the ten volumes of Lyric Pieces for piano. These short, attractive gems reveal a strong national flavor, combining the mildly chromatic style of nineteenth-century salon pieces with elements of Norwegian folk music. They are also relatively easy to play, being tuneful and rather accessible in style. Such a winning combination delighted the public and publisher alike, and almost singlehandedly assured Grieg a comfortable old age. Book One, Op. 12 opens with a delicate "Arietta," a cantabile melody accompanied by rippling arpeggios divided between the two hands. Subsequent sections include a "Waltz," characterized by a recurring stacatto passage; "The Watchman's Song," an unpretentious theme presented in repeated two-bar cells, surrounding a faster, more propulsive middle section; a lilting "Fairy Dance"; a mazurka-like "Folk Tune"; a vigorous "Norwegian Melody," which contains a deep, drone pedal point; "Album Leaf;" and "National Song." Source: AllMusic (https://www.allmusic.com/composition/lyric-pieces-8-fo r-piano-book-1-op-12-mc0002361225 ). 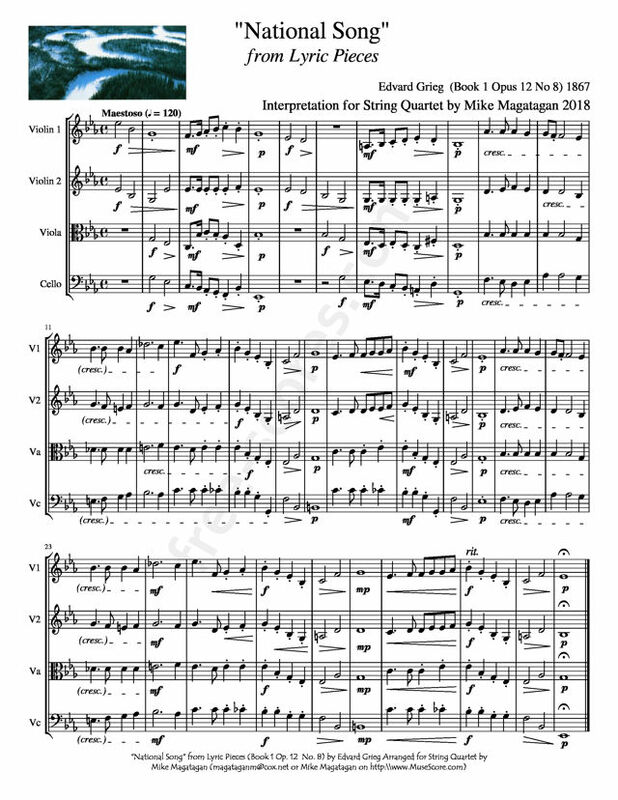 Although originally composed for Piano, I created this Interpretation of the "National Song" from Lyric Pieces (Book 1 Op. 12 No. 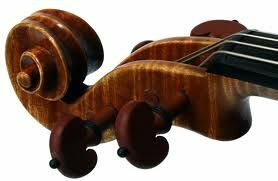 8) for String Quartet (2 Violins, Viola & Cello). › Fantasy VI from 12 Fantasie for Violin & Viola.